The last week or so has been a mixed bag of change in the Olympics. Going from going from humid, wet and muddy on the Hoh Rainforest floor, to sun and snow in the alpine. All this sun has taken me by surprise, not something a man from Washington would be acclimated to. Drinking over 10 liters of water a day and lots of sodium intake, still feel the effects from the exposure. Besides that energy levels are good, considering all the elevation I gained and lost the last few days. Pulled a 12 hour hiking day and still had a bit of gas in the ol' tank. Crossing exposed snowfields while gaining elevations. I thought to myself, 'Boy, sure glad I took my training serious over the winter. If green, would've been in a world of hurt'. Can not express enough on how much attention should be given to prepare fitness level for a successful trip. Unless you have a very active career, physically prepare for backpacking. There was a section this weekend, where I didn't see or talk to a person for 72 hours (besides to myself). I find that type of isolation very inspirational. Wish I would have brought some note paper, to write down thoughts. Maybe I will add that to my packing list? Section 1a and 1b are now complete. This route led me from the rugged North Olympic Coast of Washington State, then following a glacier fed river to its source and then walking over the Divide; so took look back at everything you just travel across, ocean, mountains and glacier in one view. What an awesome journey. 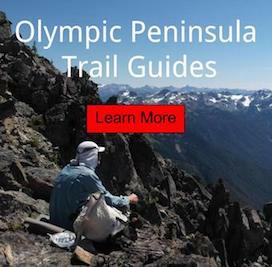 If you want to truly experience the endless beauty of the Olympic National Park, this is the way to see it. I highly recommend walking this route, it is life changing. It will take you 2-3 weeks to complete (depending comfortable milage per day). Feel free to email me and I can send you more details on trip prep. Now I resupply food and head out to start Section 2. Look for a full Trip Report post in Autumn/Winter. 48 hours apart, looking opposite directions of Mount Olympus. There has been a lot of guessing and theories on when the Olympic high county will melt out this year. Even I was off about 2 weeks. Comparing everything to the last 3 hiking seasons; since thats how long I have truly enjoying the ONP. The last 2 years have also been heavy snow years, which means late season melt; if at all. Here is my forecast. Everything is about 4 weeks ahead of last year. There is a 24" average (and melting) in the elevations of 4,000' to 5,000' elevations, up to 6' in open areas higher. All southern exposed basins should be melted out by mid July, depending on upcoming weather patterns and tree cover. 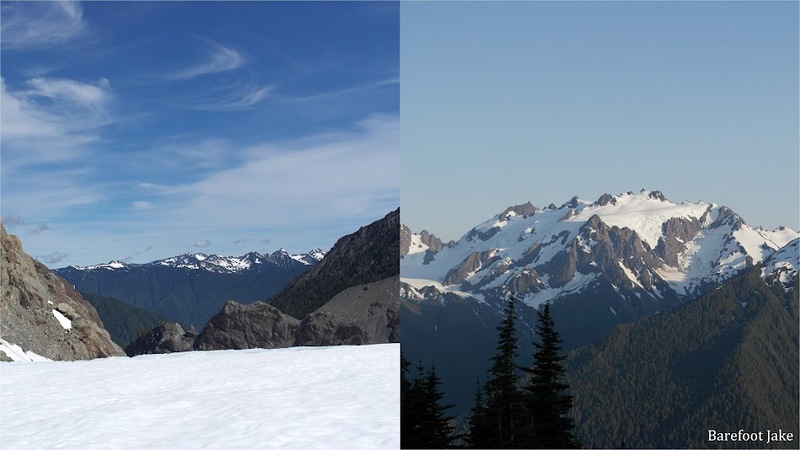 Mount Olympus/ Blue Glacier snow cover was perfect (in my book), but is melting rapidly. Personally watched lots of melting happen all around me on the always changing mountain. If you're going to climb, better get up there fast: unless you like lots of open cravasses. High Divide/Sol Duc drainage. Lots of snow on the ridgeline of the Divide. Patchy snow in the alpine on all slope directions. Be careful on exposed sections for the next few weeks, until they melt out. Thousands of Avalanche and Glacier Lilies can be seen as your reward on a few melted high meadow patches; well as greeting you into the alpine areas. What a pure treat. Soft snow coverage on the Blue Glacier, crevasses open daily; because of weather. Skiers ascend toward Crystal Pass on Olympus. Hoh Lake is 90% covered and lots of exposed snowfields to cross on east/west facing slopes while leaving the Hoh drainage into the Sol Duc. Bailey Range from Cat Peak to Childs Glacier. 7 Lakes Basin/ Lunch Lake area.